Travis Garland has a voice that truly everyone should get to know. In 2011, my ears (and yours) live in a world that is too often saturated in over-processed pop music. Some of it is good based on its sizzling beats alone. Some of it is terrible because of its everything-including-the-kitchen-sink production mentality. It's up to us as music lovers to sift through the bad, the bearable and the good to find artists that possess the vocal talent that is becoming more and more of a rarity in the Top 40 Music Market. Travis Garland has one of those voices. Unfortunately for Travis, the obstacles that stand in his way toward discovery and mass consumption are currently blockading his potential to be truly great. I've mentioned Travis several times before. Many know him as the main vocalist for the now defunct boy band pop group NLT (Not Like Them), which also featured Kevin McHale (current star of 'Glee'), Justin Thorne (currently of Darkchild-assisted boy band One Call, managed by Johnny Wright) and V Sevani (currently pursuing indie solo work). Of the four, Travis was the first to be snatched up post NLT-Apocalypse, signing a deal with Universal Interscope. His signature melismatic vocal acrobatics were more akin to R&B and urban artists rather than that of the frothy boy band variety, and his current musical exploits are more indicative of his personal vocal capabilities. That's not to say NLT wasn't worthy of attention, and their potential to be great still makes me mourn for what could have been.. However, the past is definitely past, and now two or so years after the NLT breakup, we're still waiting for a legitamite release from Mr. Garland. Shortly after the breakup, he announced his relation to Jessica Simpson's father's management company (Papa Joe), and sometime after that, he "released" a hype song in the form of a "remake" of T.I. and Justin Timberlake's "Dead and Gone", and eventually an indie video rough cut for his redub of Beyonce's "Sweet Dreams", as "Beautiful Nightmare." Then came the "stamp of approval" from the notorious Perez Hilton (like it or not, it's a meaningful boost of awareness) and the Danja-produced single "Believe". MTV dubbed him a 'New Artist to Watch'. He even debuted the song live in a performance on last season's 'American Idol'. Then the gravy train just stopped. Just when it seemed to be finally picking up in his favor. Travis is a perfect example of the disconnect in the state of pop music affairs. It is growing more and more difficult to break a new artist because record labels are afraid of offering up new product if it may not have instantaneous appeal and immediate recoupment. Hence the fact that a vocalist like Garland was offered up with a comparison tag to Justin Bieber, despite the fact that his music is much less saccharine, much more vocally intense, and feature much more of his own creative input. Almost all of Garland's promotion post 'Idol' has been of his own accord. Despite Perez Hilton's insistance of his support from the very beginning, his championing of Garland has virtually been silenced when "Believe" failed to burst into the stratosphere. 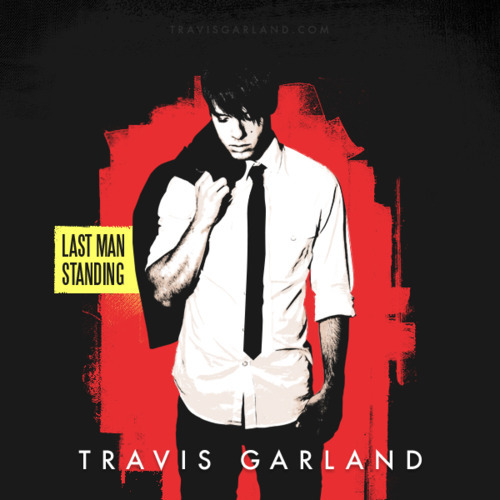 He also released a mixtape project of his own for free on his Tumblr blog/new official website, appropriately titled Last Man Standing. The five song project was inspired by various James Bond films, and often feature samples from the series more poignant film scores. My favorite cut, the album's namesake, features a melody line that harkens to Chris Brown's "Wall to Wall", outfitted with zappy synthy underbeats, and displays his incredible vocal range. It's infused to capacity with the project's cool, mature, confident mantra, and helps shuck off the pre-concieved notions that seem to be dogging him. The single from the project, "Everything Right Now", also follows that lead -- smoky, confident and highlighting Garland's desperation toward total creative control, and the ability to stand on a stage as himself. The video also provides the necessary aesthetics in the pop music world (read: he's easy on the eyes, but this is hardly news to moi), and while truly debonair like 007 he may not quite be, it's not so much about the image as it is about the drive, the mentality, and at the end of the day the voice, which just cannot be denied. These days, just about any one can be a pop singer. The true vocal greats, the creative visionaries, the performers, this is who should be celebrated. For that reason alone, Travis Garland deserves his share of the pop landscape. I want to like him...I really do. Something just isn't clicking, though. I hate to say it, but I think on the industry side having Perez back him might actually have been a bad thing. Perez has helped bring attention to already signed artists where the buzz had begun, but he's had a horrible track record with new artists. Here's hoping he finds something that clicks.